MEATH (CelebrityAccess MediaWire) — Some of the top country acts laid musical siege to Ballinlough Castle in Athboy, county Meath for the first Midlands Music Festival, held on July 28 & 29. The festival was produced by Pod Concerts, who also stage The Electric Picnic in Stradbally each summer, and Rag Lane Entertainment, who promote David Byrne, the Dixie Chicks & Jackson Browne amongst many other acts and shows. 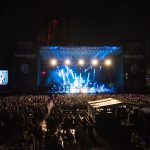 Turnout was reported to be solid, and public response prompted the promoters to extend the length of the festival, starting three hours earlier than had been previously advertised. This drew some criticism from fans who also complained about long restroom lines. Promoter John Reynolds has promised to address these problems next year. Otherwise, the atmosphere was described as laid back and relaxed. The performances were spread across a main stage and smaller, more more intimate tent. The lineup included Kenny Rogers, Van Morrison, Dwight Yoakam, Guy Clark, Nanci Griffith, Glen Campbell, Don McLean, Albert Lee and Emmylou Harris. – CelebrityAccess staff writers.